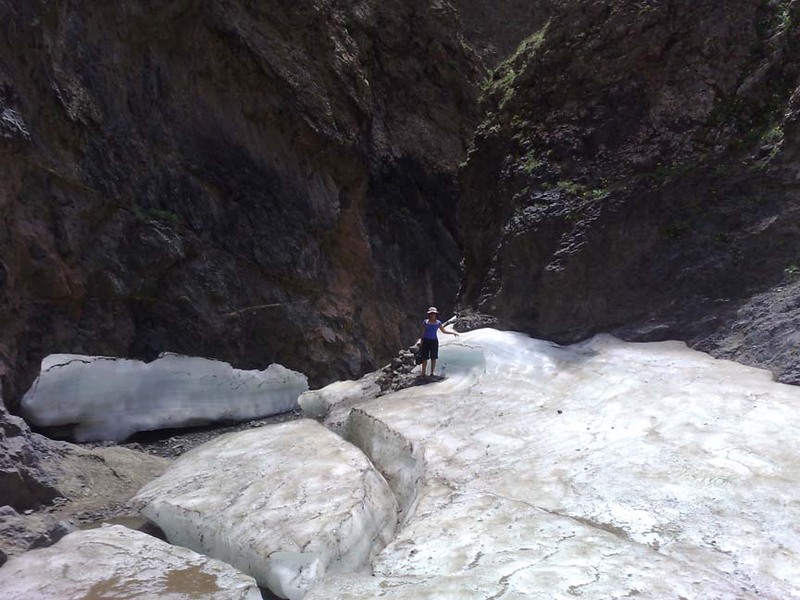 One of the reasons why we visited the Gobi desert is to see the ice gorge. I guess the 14-hour drive from UB to Gobi, getting lost along the way and spending the night with total strangers’ ger in the middle of nowhere is all worth it. After a long argument with our driver (he wanted to follow his itinerary rather than ours, when in fact we hired him as our driver and not as a tour leader), over an hour drive from the camp, a camel ride (again, our driver took the liberty of booking a horse ride for us without even informing us, obviously we declined the horse ride and opted for a camel ride that seemed to take forever to reach the ice gorge ), and a few minutes of walking, I guess it’s all worth it. We were a little hesitant to choose the ice gorge over sand dunes as part of our itinerary that day. We thought that we might not see the real ice gorge as it was summer time but the lady from the camp gave us an assurance that we wouldn’t be disappointed. So, we skipped he big sand dunes as we’ve already seen the small ones on our way to the camp. I know it was really sad to miss those big sand dunes but we didnt have that much time as we needed to go back to UB as scheduled to see the opening ceremony of the Naadam festival. The sand dunes trip was originally part of our itinerary but we got lost on our way to the camp and forced to spend the night somewhere in Gobi, spend another few more hours changing/fixing tires the following morning and spending another few more hours finding our way to Three Camel Lodge. In effect, we lost one precious day in Gobi, we missed the chance to see big sands. I just told myself, “at least I was able to see the ice gorge”. I have a lot of nice photos but I can’t post them all here as they’re going to be included in the book. 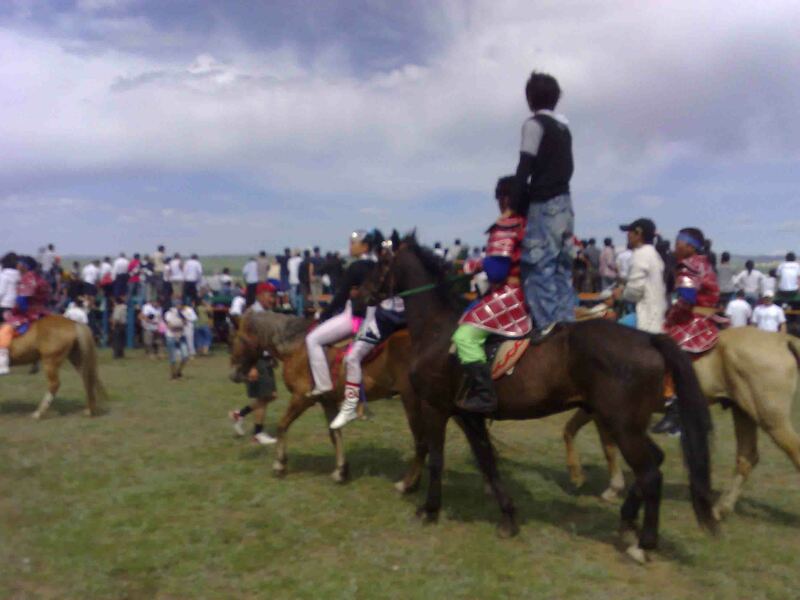 Second day of the Naadam festival was the traditional horse racing. As i”ve mentioned in my previous post, we booked this tour with Chez Bernard. The call time was at around 7am at the Chez Bernard cafe. Breakfast was included in the packaged tour so everybody was expected to have breakfast at the cafe before heading off to the race track. We arrived a bit late because we preferred to have our breakfast in our hotel. If I still remember it correctly, it was more or less an hour drive from the city. On our way to the race track, our tour guide gave us some information about the horse racing tradition and also advised us be careful and to stay away from the big crowd after each race as the locals would run towards the winning horse to touch it. They have this belief that the sweat of the winning animal will give them good fortune all year round. Once we got off the bus, I was like.. “where’s the race track?” All I could see was a sea of people; thousands of people, Mongolians and tourists /travelers from different parts of the world. 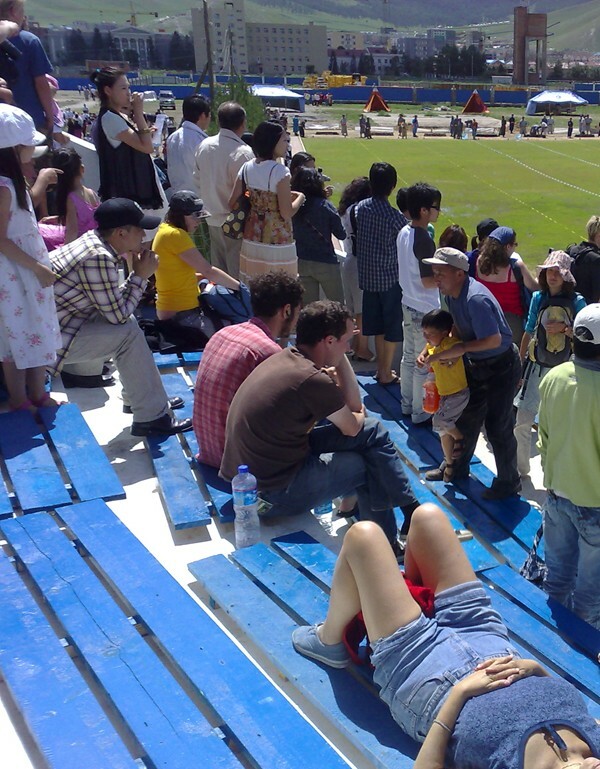 Well, I guess it was a bit ambitious to expect a proper race track in that part of Mongolia. The locals were dressed as if they’re going to a party, ladies were wearing high heels.. i don’t think high heels and grass work well together. There are also a lot of food stalls around but the only thing I could buy was a can of coca cola, just didn’t want to have an upset stomach again. Lunch was part of the package, it was said to be a barbecue lunch. 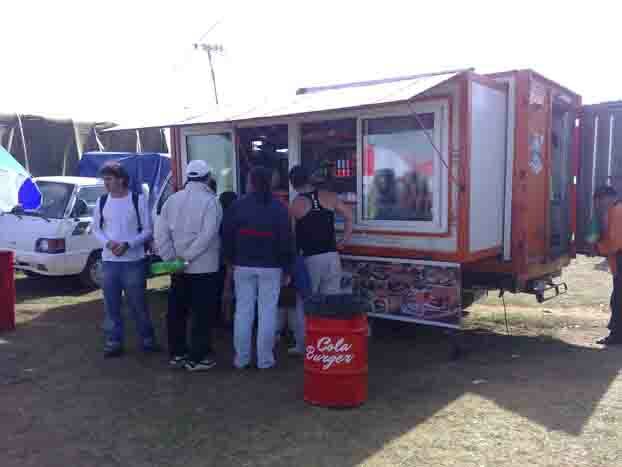 We camped a few hundred meters away from the big crowd and everybody waited for our lunch. When the lunch came, X and I were like… “I’m starving but I cannot eat that meat”. They said it was beef ribs barbecue but it didn’t look like barbecue to me. It looked like boiled beef with potatoes, and the smell was horrible, I really couldn’t eat that meat unless I havent eaten for weeks. I was really surprised to see everybody enjoying the “barbecue” but X and I just had a few slices of potatoes and a can of soda. When we returned to UB, we ran off to our favorite French bistro once we got off the bus to have a proper meal. 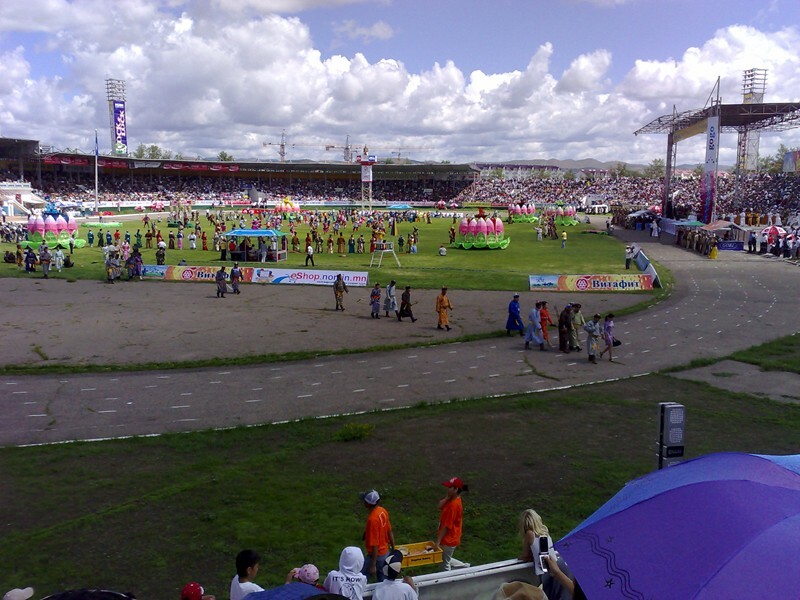 The Naadam festival in Mongolia is a yearly event celebrated in July. This is one great event that every single person in Mongolia looks forward to and definitely one big tourist attraction in the country. I was able to witness this event two years ago along with hundreds of tourists and travelers. 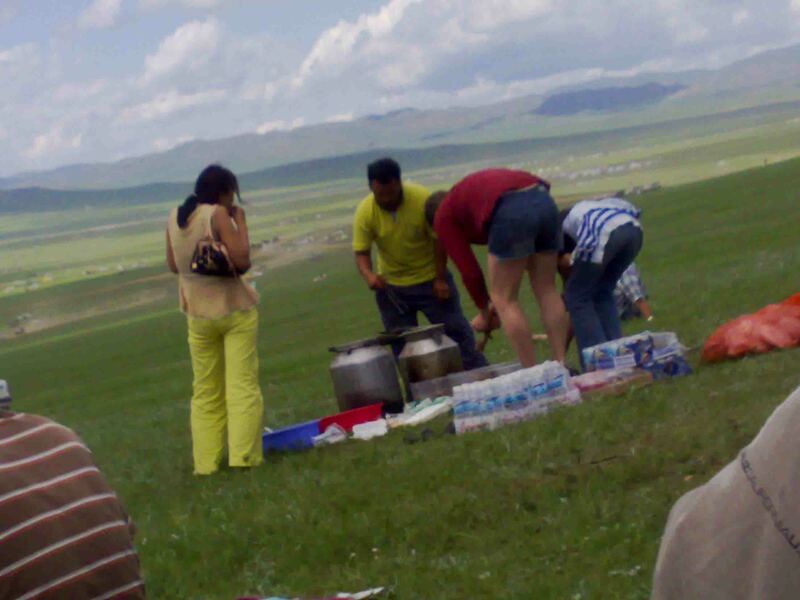 Many tour operators in Ulaanbaatar sell packaged tour of the said festival. We bought a two-day package which includes a guided tour to the Stadium to watch the opening ceremony, wrestling and archery matches, lunch for 2 days, horse racing (2nd day) and transportation. On the opening day the plan was to walk to the stadium from the Sukhbaatar square but I really didn’t want to walk, walking is one thing that I’m not fond of. Fortunately, there was one tourist who arrived at the assembly place about 30 minutes late, so our tour guide decided to take a taxi to the stadium and that was a big relief. We had an english speaking guide and she was really nice and friendly. We even had a little conversation and I learned that she was a post graduate student and been to New York and South Korea to study. I also learned that a lot of students in Mongolia, the ones who can speak the english language properly [if not fluently] do tour guiding job during summer breaks.This is also their way of practicing and learning the language. The opening day’s events include the colorful opening ceremony, speech by the president and of course we didnt have a slightest clue what he was saying, wrestling and archery matches. 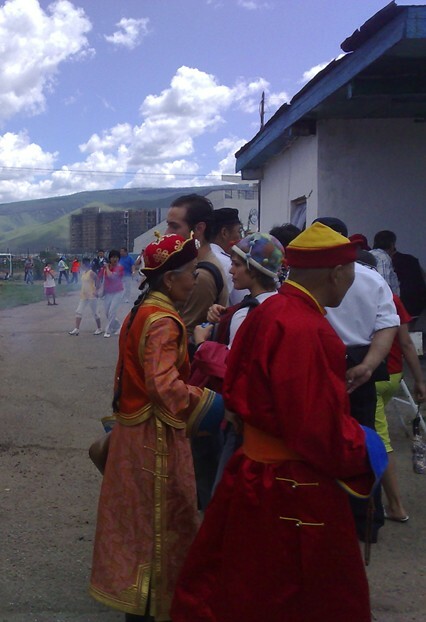 I was really surprised to see how Mongolians dressed up for the event. A lot of women were in evening dress and high heels while the older ones were wearing the traditional Mongolian costume and the crowd was in a very festive mood. After the opening ceremony, we headed to another stadium to witness the archery match. It was a smaller stadium and getting in was a great deal of effort as there were too many people all wanting to see the match. I must admit I didn’t enjoy it that much. Well, as the saying goes, when in Rome. I took a few photos and after about 15 minutes we decided to leave and headed to the park where our packed lunch would be served. I caught a really interesting sight inside the stadium, while everyone was busy watching archery, and couldn’t resist capturing it. 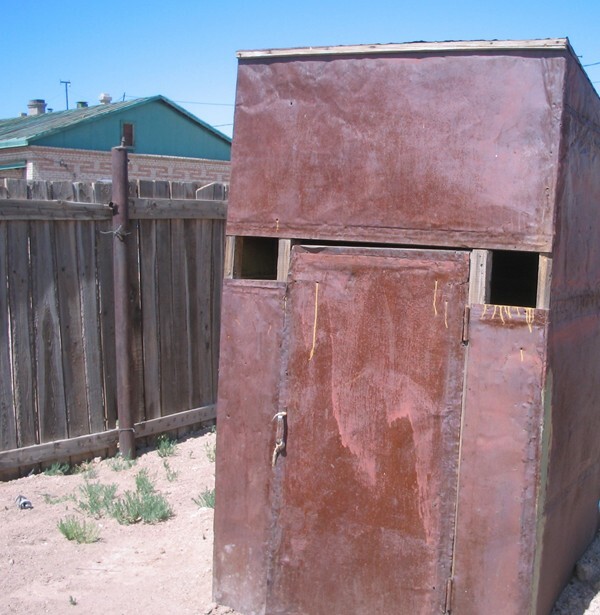 I know this article may not sound interesting to others but this is still part of my travel experience in Mongolia so I thought I should still post it. This is related to my previous post.. largest toilets in the world . Some of you might be wondering how I did on our way back to Ulaanbaatar. Well, having experienced such a huge embarrassment and difficulties, I should say I’ve learned my lessons. I had a proper breakfast before we left Three Camel Lodge knowing that it was going to be a very long drive again. I made a several trips to the toilet before leaving as I didn’t want to be embarrassed [that much] again. In almost 14hrs of travel I only had an apple, an orange, a handful of several kinds of nuts and about 500ml of water. I intentionally lessen my water intake and it was very difficult for me as I normally drink lots of water. Our first stop was in a small [ghost] town. It only had a few box-like buildings, there were also a few kids selling crystals and other souvenirs to tourists. There was a small cafe where our driver had his breakfast but X and I didn’t bother to try the food. I was a little glad to find a place like just a few hours after leaving the camp so I went inside to buy 2 cans of coke, actually my main purpose was to use the toilet. So I told the driver that I wanted to go to the toilet and if he could possibly ask where the toilet is. To my disappointment again, he said that it was just outside the building. I was like, “outside? in this area?” With all the disappointment on my face, I went out and looked around. I saw a fenced area on my left and the gate was open so I told X to go with me. It occurred to me then that at least the public wont see but I still couldn’t believe it so I decided that I will just use the one I had before, another very large toilet all to myself. Just when we were about to go back to the car, I spotted this thing. Out of curiosity, I came closer and tried to figure out what it was. I told myself this couldn’t be the toilet but as I was getting closer, the evidence was getting stronger. And yes, it was a toilet. For all of you who have seen the movie Slumdog Millionaire, you’ve got an idea now what it was like inside. I’ve perfectly learned my lessons now.. Dont drink too much water while on the [extremely remote] road.